USA Today blogger Joyce Lamb is joined by best-selling and emerging romance novelists from three of the top publishers of the genre: Harlequin, Avon and Forever. The Bryant Park Reading Room located on the 42nd Street side of the park - under the trees - between the back of the NYPL on 5th Avenue & 6th Avenue. Look for the burgundy and white umbrellas. Saratoga: Susan Elizabeth Phillips "Heroes Are My Weakness"
Please note: Online ordering for this event has been turned off at this time. If you are still interested in purchasing books for this event, please call us at 480-730-0205 between 10am and 9pm MST. Thank you. 7PM MONDAY, JULY 16 Susan Elizabeth Phillips: The Great Escape Bestselling author Susan Elizabeth Phillips, the only four-time winner of the Romance Writers of America's Favorite Book of the Year Award, visits with The Great Escape, the continuation of the story she began in Call Me Irresistible. Lucy Jorik is a champ at never embarrassing the family she adores—not surprising since her mother is one of the most famous women in the world. But now Lucy has done just that. Instead of saying "I do" at the altar, Lucy hitches a ride with a rough-looking stranger who's raised rudeness to an art form and couldn't be more foreign to her privileged existence. While the world searches for her, Lucy needs to toughen up—and fast. At his rambling beach house on a Great Lakes island she hopes to find a new direction for herself and unlock the secrets of a damaged man who knows so much about her, but reveals nothing about himself. Where do you run to when your life has fallen apart? Lucy Jorik is a champ at never embarrassing the family she adores-not surprising since her mother is one of the most famous women in the world. But now Lucy has done just that. And on her wedding day, no less, to the most perfect man she's ever known. Instead of saying "I do" to Mr. Irresistible, Lucy flees the church in an ill-fitting blue choir robe and hitches a ride on the back of a beat-up motorcycle plastered with offensive bumper stickers. She's flying into the unknown with a rough-looking, bad-tempered stranger who couldn't be more foreign to her privileged existence. While the world searches for her, Lucy must search for herself, and she quickly realizes that her customary good manners are no defense against a man who's raised rudeness to an art form. Lucy needs to toughen up-and fast. Her Great Escape takes her to his rambling beach house on a Great Lakes island. Here, she hopes to find a new direction . . . and unlock the secrets of this man who knows so much about her but reveals nothing about himself. As the hot summer days unfold amid scented breezes and sudden storms, she'll also encounter a beautiful, troubled beekeeper; a frightened young boy; a modern-day evil queen; and a passion that could change her life forever. In this dazzling follow-up to her New York Times bestseller Call Me Irresistible, Susan Elizabeth Phillips tells the funny, touching, enchanting story of a young woman searching for her destiny . . . and of a damaged man who doesn't believe in second chances. Susan Elizabeth Phillips is the only four-time recipient of the Romance Writers of America’s prestigious Favorite Book of the Year Award. A resident of the Chicago suburbs, Phillips is also a hiker, a gardener, a reader, a wife, and the mother of two grown sons. (Eastwood) Girls’ Night Out & NYT-Bestselling Author Susan Elizabeth Phillips present The Great Escape Tour! Join us for our popular Girls’ Night Out author series as we welcome New York Times bestselling author Susan Elizabeth Phillips, the only four-time recipient of the Romance Writers of America’s prestigious Favorite Book of the Year Award. One of today's most beloved writers, Phillips has followed up last summer’s hit, Call Me Irresistible, with a sequel that's equally impossible to resist, earning her starred reviews in Booklist and Library Journal. Lucy Jorik is a champ at never embarrassing the family she adores—not surprising since her mother is one of the most famous women in the world. But now Lucy has done just that. And on her wedding day, no less, to the most perfect man she's ever known. Instead of saying "I do" to Mr. Irresistible, Lucy flees the church in an ill-fitting blue choir robe and hitches a ride on the back of a beat-up motorcycle plastered with offensive bumper stickers. She's flying into the unknown with a rough-looking, bad-tempered stranger who couldn't be more foreign to her privileged existence. The Great Escape is a rollicking roadtrip to Michigan, filled with hilarious mishaps, unexpected fun, and sizzling romance…a laugh-inducing, tear-rending tale that could only be told with such charisma, whimsy and poignancy by Susan Elizabeth Phillips, one of the biggest stars in women’s fiction today. Susan Elizabeth Phillips promotes Call Me Irresistible. 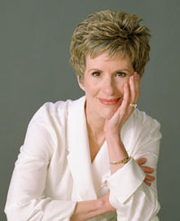 Susan Elizabeth Titus was born 11 December 1948 in Cincinnati, Ohio, USA, daugther of Louesa Coate and John Aller Titus. She met her husband, Bill Phillips, on a blind date while in college. She obtained a BFA in Theater Arts from Ohio University and taught high school until her first child was born. She then became a stay-at-home mom. She started to write by accident when her husband’s job moved them from Ohio to New Jersey. She and her best friend, Claire Kiehl Lefkowitz, were avid readers. They decided that they would write a book together. With blind luck, they worked their way through a story and Dell bought that manuscript published under the pseudonym of Justine Cole (reedited under their real names). Susan had been bitten by the writing bug and continued to write when Claire moved to the southwest. Her subsequent novels have gone on to win awards and land on bestseller lists. In addition to being the only two-time recipient of the Romance Writers of America's prestigious Favorite Book of the Year award, she also holds Romantic Times Career Achievement Award. Susan and her husband live in the suburbs of Chicago, Illinois. She is the proud mother of two grown sons. Susan Elizabeth Phillips's book The Great Escape: A Novel was available from LibraryThing Early Reviewers. Susan Elizabeth Phillips's book Call Me Irresistible was available from LibraryThing Early Reviewers. Susan Elizabeth Phillips is currently considered a "single author." If one or more works are by a distinct, homonymous authors, go ahead and split the author. Susan Elizabeth Phillips is composed of 13 names. You can examine and separate out names.